Use of Classroom, AIARE Field Book, Single-ride ticket at Stevens Pass (if needed), 24 hours of instruction. Transportation to/from the course area, personal food, personal climbing equipment, trailhead parking pass fees (if needed), additional books that you may chose to purchase. New for 2017 the AIARE Level 2 has been redesigned to meet the needs of advanced recreational backcountry users that have previously taken both the AIARE Level 1 and the AIARE Avalanche Rescue Course. 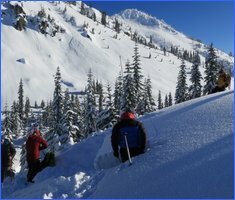 The AIARE Level 2 is a 3-Day / 24-hour course that provides backcountry travelers an opportunity to advance their decision making skills in more complicated situations such as being the group leader, developing a travel plan in areas without an avalanche forecast, or travel into more complicated terrain. The AIARE Level 2 course builds from the introductory avalanche hazard management model introduced in the AIARE level 1 and adds to it the evaluation of factors critical to stability evaluation. The classroom sections of the course are based in Leavenworth, WA and we use a variety of field locations giving us the ability to observe a variety of snowpacks at various elevations. Much of the training takes place in the backcountry and requires participants to be able to move efficiently in a backcountry environment. AT skis or a split board with skins are your best choice for backcountry travel. Standard Observation guidelines and recording formats for factors that influence or indicate snow stability. Students must have taken both the AIARE L1 and the AIARE Avalanche Rescue Course to participate in this program. We will be offering the Avalanche Rescue Course the day before each scheduled AIARE L2 in order to send you into the course with current rescue skills. If you prefer you can take the Avalanche Rescue Course on one of the other dates offered in advance of your course. Participants must be on an AT setup, Tele Setup, or split board. You should be able to skin uphill, and move efficiently in the backcountry as the course involves a decent amount of backcountry travel. We are very excited about the reformatted AIARE Level 2. In the past we felt that our Level 1 students were lacking in the perfect opportunity to continue their avalanche travel related training. The previous Level 2 came in a bit too tech for your average recreational user, but the previous level 1 did not have an effective way to provide continuing education for Level 1 graduates. The new AIARE level 2 builds significantly on material covered in the AIARE L1 and serves as both a good refresher and powerful opportunity to expand your understanding of how weather, snowpack, and avalanches processes relate to observations and travel in avalanche terrain. Recommended equipment is covered in detail in our equipment list, but there are some items we would like to point out. If taking the level 2 you should own a beacon, shovel & probe. We also rent these items. Ideally your probe will have measurements in 1 cm graduations allowing this to stand in for your ruler. You should also consider picking up a copy of the 3rd edition of the Avalanche Handbook as well as a copy of the snow, weather and avalanche observation and recording guidelines (SWAG). You can view the SWAG here and you can purchase the SWAG here. It is most important to have a basic snow study kit including: Snow thermometer (Celcius required, digital is nice), a Loupe or magnifying glass (10x to 20x magnification), 2 mechanical pencils, and a Crystal screen. We will give you a field book for recording data that includes useful cheat sheets to remind you of the most commonly used items from the SWAG manual published by the US Forest Service. Other items that are not required, but that you might consider include: a compass, altimeter, inclinometer, snow saw, and rutschblock cord. If working as a professional you will already own most of these items. If not working as a professional you might consider bringing what you have to the course and then deciding what to buy at the end when you have had a chance to see all the latest and greatest gear during the course. Brooks Range Mountaineering is a good source for snow science materials. You must provide your own food, lodging, and transportation during the course. Most days will involve some indoor work in Leavenworth with field sessions taking place at a variety of locations in the mountains surrounding Leavenworth. Our winter 2017-18 courses are based out of the Sleeping Lady Mountain Resort, located at the mouth of Icicle Creek Canyon. Lodging is not included in the course, but Leavenworth does have a wide variety of lodging options. There is also a possibility that participants from the course may be able to house people from outside the area if you are looking for less expensive lodging options and open to a bit of couch surfing. The following are some of our preferred lodging options. This information will be sent to you along with the pre-trip materials, but you will be asked to complete a pre-course quiz and bring this to the course start. The idea behind this it to have you review your own recollection of AIARE level 1 knowledge prior to the course start. View the AIARE Level 2 Pre-Course Quiz.